Is your name Richard Petty? No? Well, that must mean that you're not the King. That doesn't mean you can't drive like the King. Well, actually you most likely can't - but today's Nice Price or Crack Pipe Pontiac will at let you pretend, and that's got to be worth something. Unsurprisingly, yesterday's 1984 MB 280TE took home a solid 67% Nice Price win at its eighty-five hundred dollar asking price. In fact, what was surprising is that the car had apparently not been snatched up by some brand fan before it even got to us. Regardless of the inconsistencies, it was a fun car to contemplate, and perhaps a type that everyone should consider owning before they die. Yep, we're going to talk about death now. You know how they say that when you die your entire life flashes before you eyes? I wonder, when Pontiac died, what life-images flashed before its arrowhead eyes? Visions of GTOs? Bevies of Bonnevilles - the marque's longest-running brand? Or maybe, just maybe even in their final moments, they kept their eyes on the Prix. 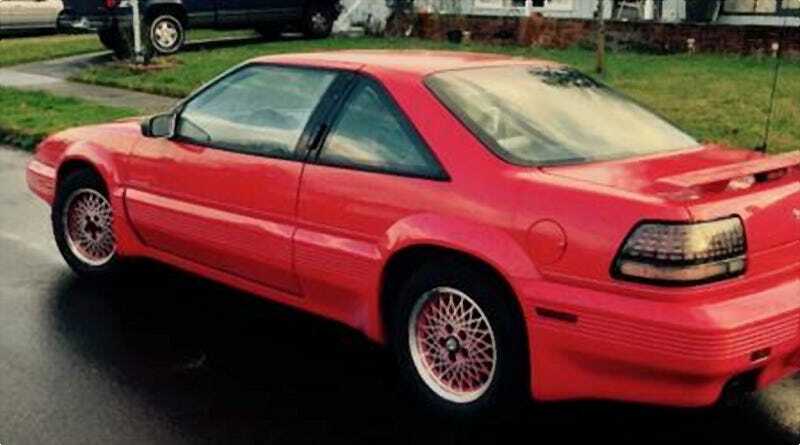 This 1992 Pontiac Grand Prix hails from the nameplate's fifth generation and its first as a transverse engined front-driver. Not only that, but its a Richard Petty Edition, featuring the iconic racer's name on the door panels under the Twin Dual Cam V6 engine identifier. With a limited run of just 1,000, these were offered in commemoration of The King's final year on the NASCAR circuit. Color options were metallic blue, white, or, like this one, red. All of the cars came with model-specific wheels, a spoiler out back, and a sequentially-numbered dash plaque which holds the immortal quote "One Great Ride With The King." Oh, and stop humming Elvis songs! Different King. They also came with the TDC (Twin Dual Cam, or Totally Dumb Call) 3.4-litre V6 mill. That was good when new for a rocking 210-bhp, and could be paired with either a 4-speed auto, or, as is the case here, with a Getrag 284 5-speed stick. There are no interior shots, but the ad does claim that it's clean in there. This car comes from Pontiac's button period, and in fact there are so many chicklits in there that they spill over and cover the center of the steering wheel. As I recall, it's a little daunting and pretty plasticky. YMMV. This special edition of a not particularly special car now seems tug at the heart strings considering Pontiac is no longer with us. Richard Petty still is kicking, so how cool would it be to roll up to his door in this and ask him to John Hancock the dashboard and the inside the trunk lid? To do so, you'll need to come up with $1,900, and hone your ninja skills to elude Mr. Petty's security detail and rocket-launching dobermans. Focusing strictly on the price for the moment, what's your take on $1,900 for this Richard Petty Pontiac? Is that deal that should have it taking the checkered? Or, is that price a black flag? Portlandia Craigslist, or go here if the ad disappears.